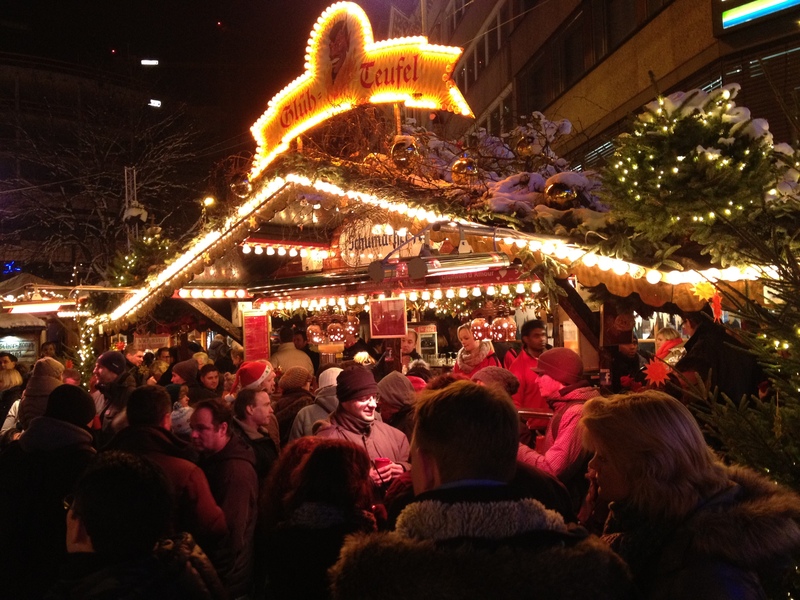 I’ve been obsessed with Christmas Markets since I was a kid. I always liked quaint decorations, fairytale villages, and a calm, peaceful throwback style of Christmas. As a teenager, I’d flip through my AAA newsletter and see the “European Christmas Market” tours, which first got my mind going. This is a thing? People do this. I want to see! In 2006, Rick Steves, my travel idol, released a special Christmas in Europe special. I’m watching it right now as I type this actually. I bought the set as a gift for my mother which also included a Christmas CD and a cookbook, and thus began our annual tradition where we’d watch and get in the old-fashioned spirit. He took us to England, Sweden, Norway, Italy, France, Austria, Germany and Switzerland for enchanting markets, beautiful scenes, and heartwarming traditions. I really wanted to go! But I was a teacher, and most of the markets closed on Christmas Eve. How could I fly to Europe before break? Then finally when I planned a trip to Belgium after Christmas in 2009, I learned the markets of Bruges and Brussels were open! I bundled in many layers, and wandered for hours and hours enjoying the setting. 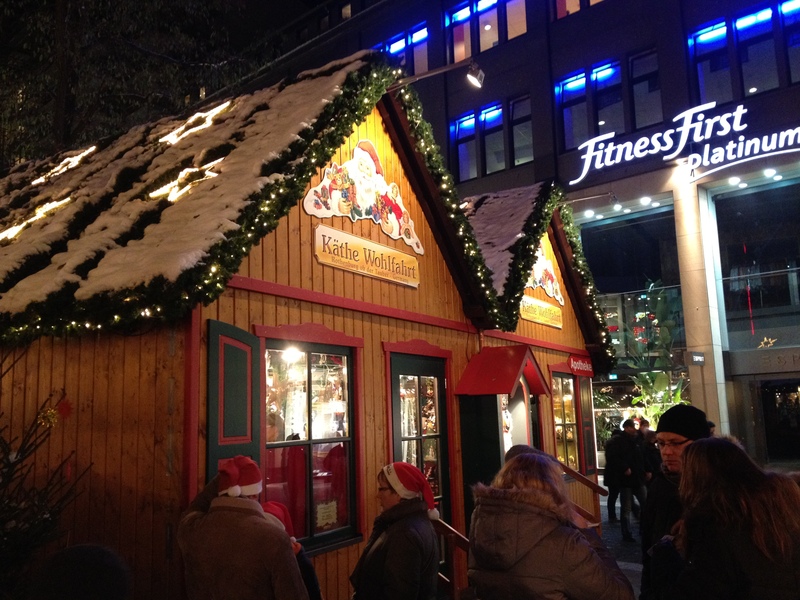 I finally got to a European Christmas Market. But Germany was the king. I had to go. 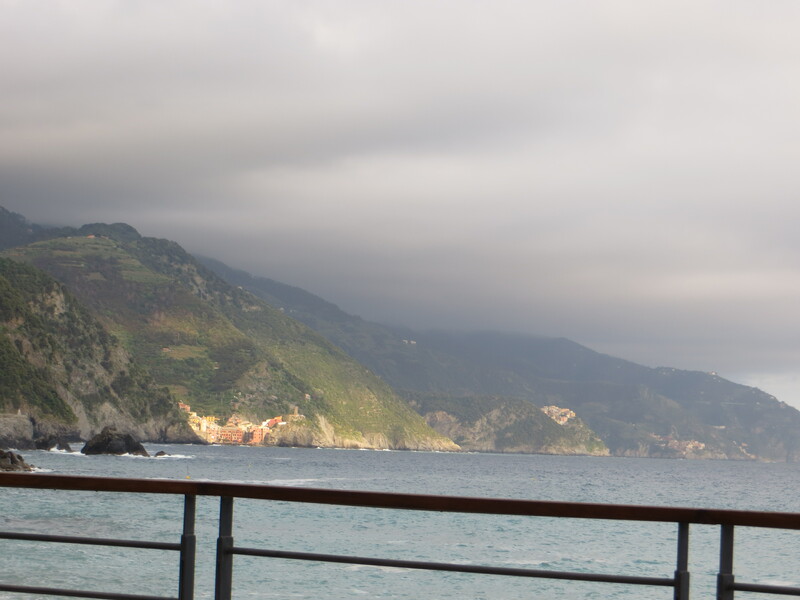 Once I moved to Italy, that became a weekend option. 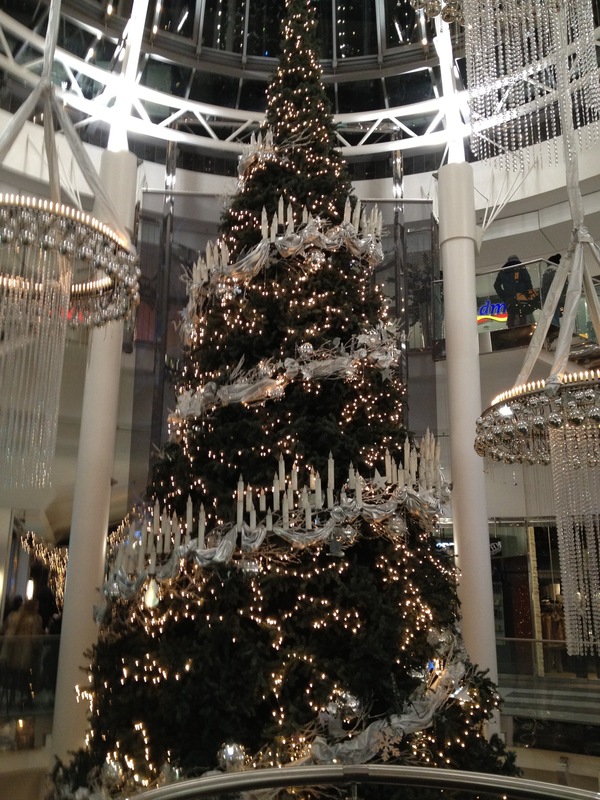 Several colleagues wanted to join me in December 2012, my first year. As we were all on a budget, we scanned Ryan Air for affordable flights to German cities. While Nurenburg and Bremen were more famous, the ticket prices were exorbitant even for Ryain Air. 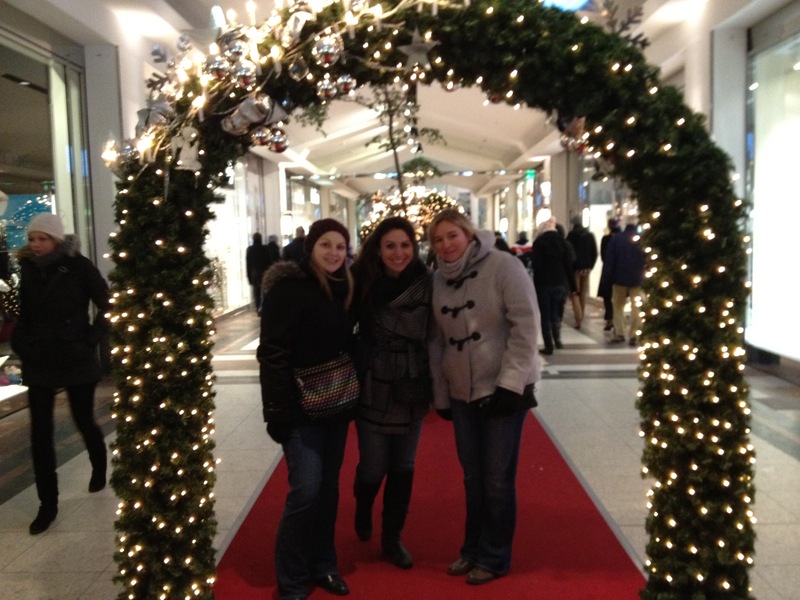 So, we soon booked flights to Dusseldorf. 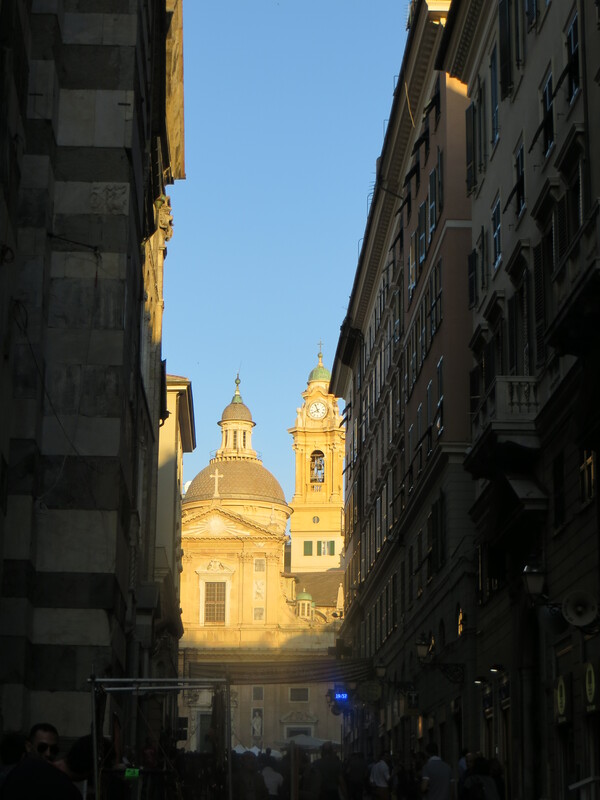 In early December, we dashed to the train station after work for the 1.5 hour trip from Genoa to Milan. As we approached, we looked out the window and saw the tracks and fields covered in . . . snow! 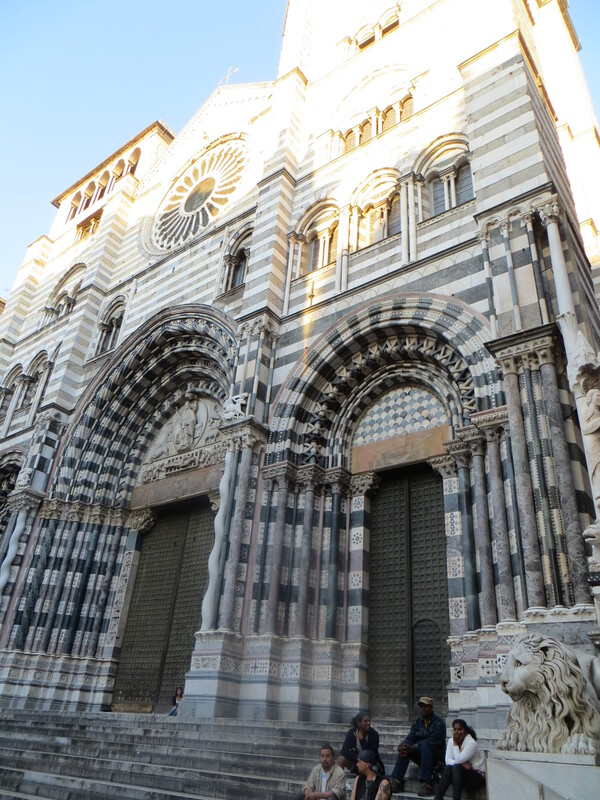 Living in the temperate Mediterranean climate of Genoa, snow was rare and special, so we were super excited and totally in the Christmas spirit. We hopped on a bus to Bergamo airport where we learned our flight was delayed because of the snow. We worried our flight would be cancelled, but thankfully it wasn’t. 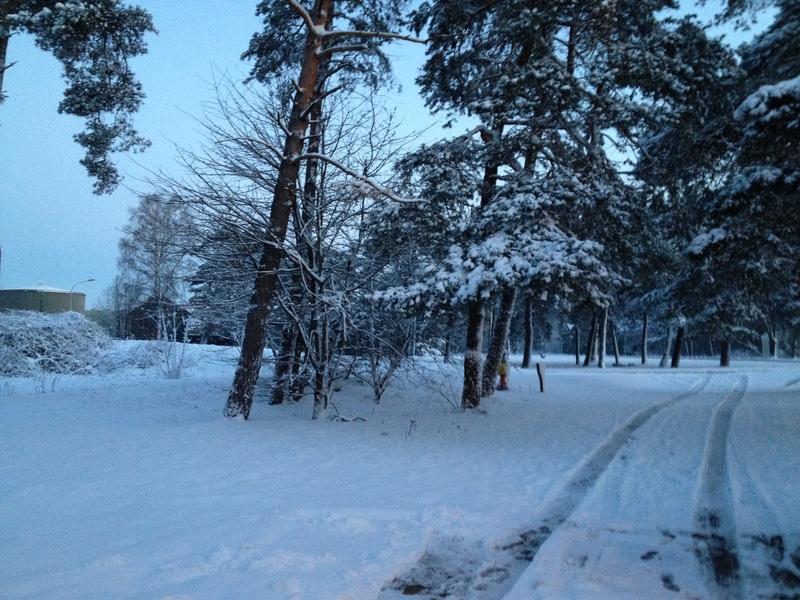 While the hostel was on the property, it was about a 20 minute walk away through snowy, dark woods. Some of my colleagues were freaked out, but I was mostly intrigued by the new surprise and pretty location. 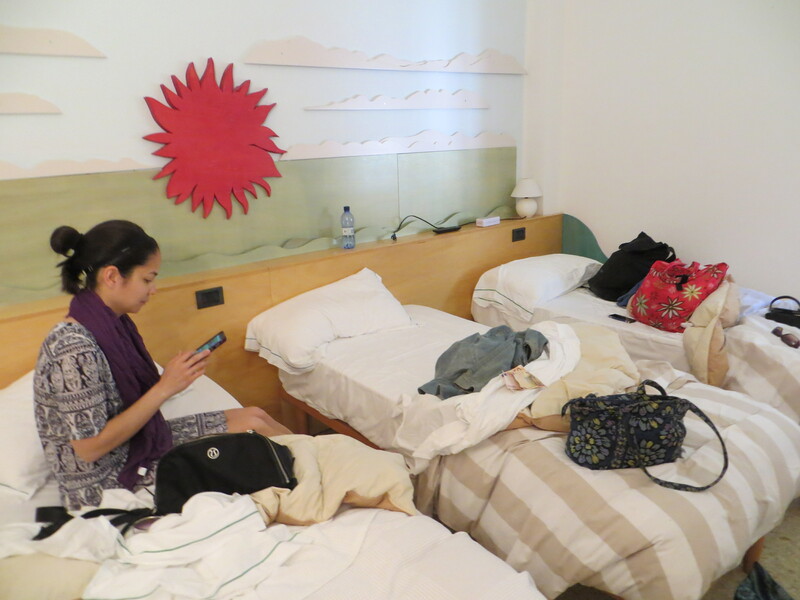 The air was fresh and crisp, and the hostel was like a little farmhouse, warm and inviting with basic accommodation. I took the single room since I actually like being alone, and fell into a deep exhausted sleep. 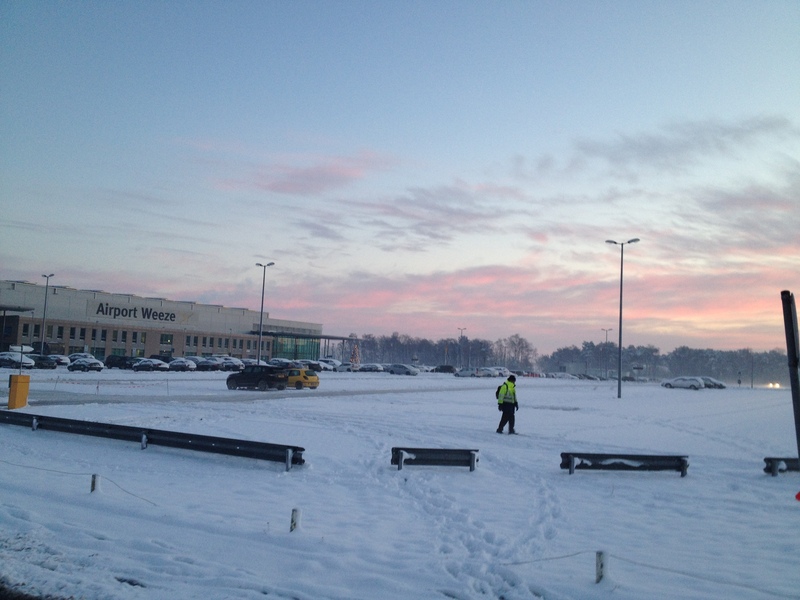 I awoke the next morning to wooded snowy views, met up with my friends, and finally took our bus and train connections to Dusseldorf as the sun rose over the serene landscape. 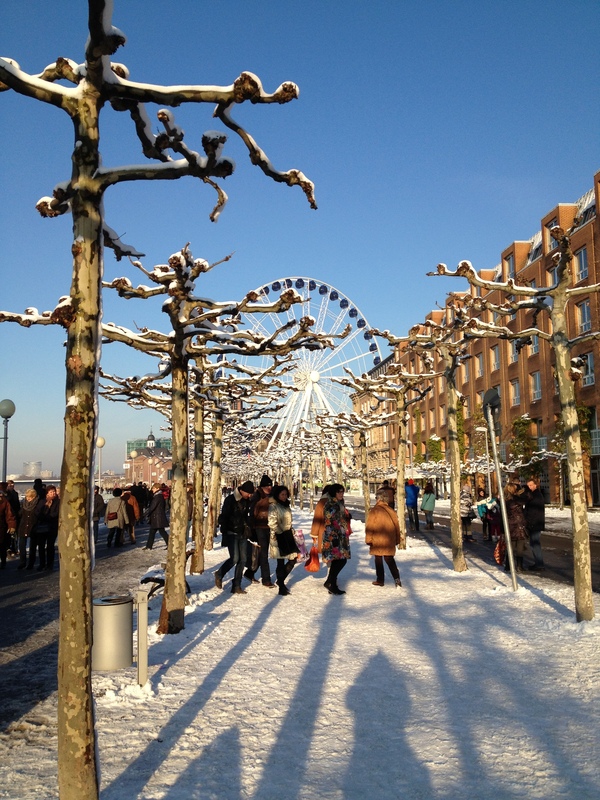 The snow caused a nightmare travel interruption–and I felt really guilty since I planned everything on this super tight budget– but we were safe, well-rested, and Dusseldorf was covered in a rare magical white blanket. We were still in the Christmas spirit. To make it even better, the hotel in Dusseldorf did not charge us for our first night since we had informed them we couldn’t make it. Awesome! This was not my first trip to Dusselforf. I had popped through on a tour of the Rhine with my friend Mike while studying abroad in the English countryside back in 2001. The Rhine had flooded, although I still remember Dusseldorf as charming and adorable. Those pleasant memories helped inform my decision to return. The streets were decked in quaint and tasteful decorations, extra magical with the freshly fallen snow sticking to the trees and lamposts. It was cold, so we had to keep ducking into cafes for a hot chocolate or a quick bite. And it was so crowded that it was hard to check out the wares in the stalls without being swept away by the tide of holiday shoppers. But it was all worth it. I was ecstatically happy to be there with new friends and about to see old friends in a couple of weeks when I flew back to America. I loved my life. 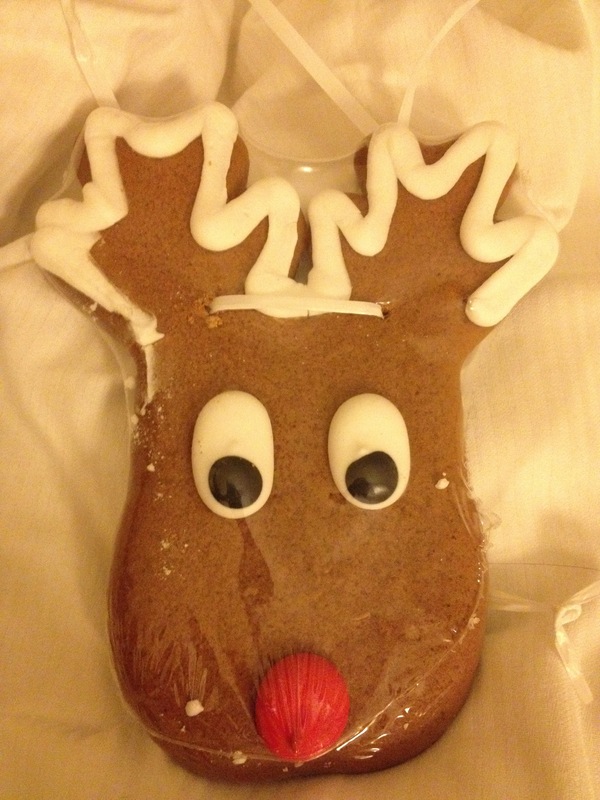 I bought some ornaments and trinkets, drank a few glasses of hot mulled wine (gluhwein) in souvenir glass mugs, and then after dinner we were back in the hotel changing for a fun night out. 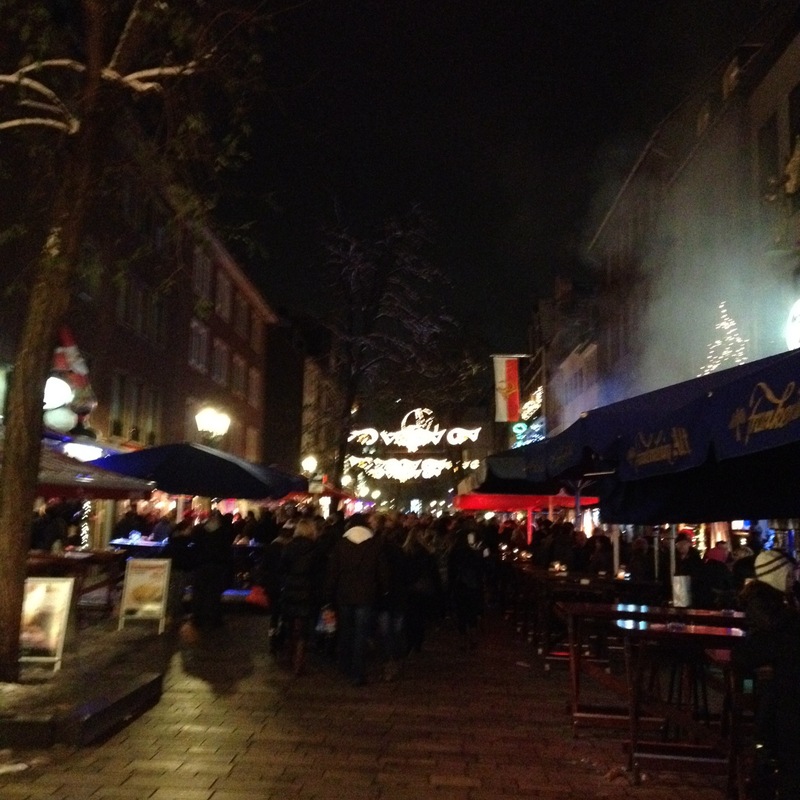 While I intended to return to the hotel early to chillax, I ended up staying out super late because Dusseldorf’s party street was filled with so many fun folks and great vibes. Since it was 2012, everyone went crazy for Gangnam style, especially the Germans. in the club I will always think of Dusseldorf when I hear it. Cheers and dancing, and finally a tipsy, happy walk back to the hotel for a deep slumber. 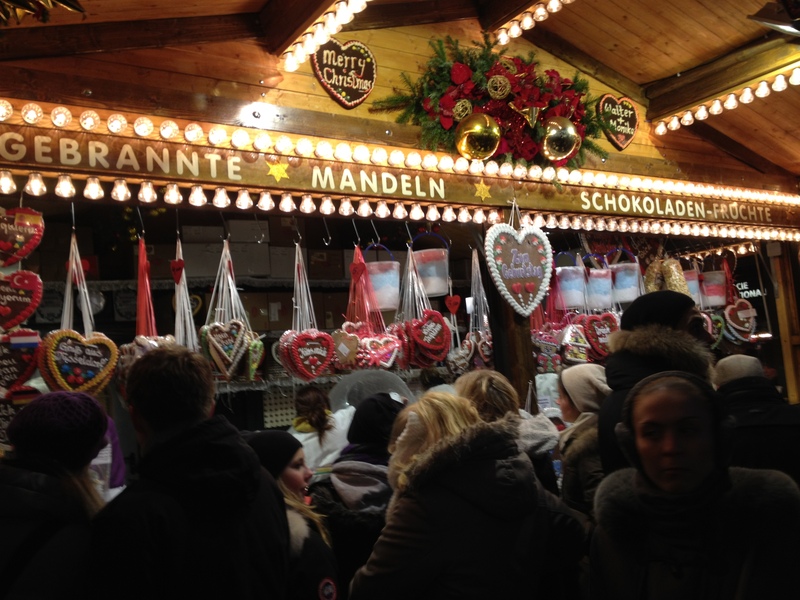 It was a quick yet magical visit, and I knew I was totally not done with Christmas Markets. As I’ve said before, I don’t travel to check things off a list. I travel to experience and enjoy. I enjoyed this! Merry Christmas! Buon Natale! Fröhliche Weihnachten! Exactly 24 years after watching the Berlin Wall topple from my tiny bedroom TV in suburban America, I walked along the remnants at the Eastside Gallery. On November 9, 1989, I was mesmerized while watching the media coverage–only 9 years old yet mature enough to understand the importance, moved by the emotions. The world was changing. Just a child who still played with Barbie dolls within her peach-colored walls, I knew I was experiencing history. I felt the joy. Some time later, I received a map in the mail along with my National Geographic Junior subscription: the new Europe. I unrolled the scroll along with travel dreams, taping it in my bedroom where it still remains today. 4 years later in 8th grade, we read Night and learned about the horrors of the Holocaust. I wanted to know and understand more about this time in history. I wanted to know how it happened. Why? I wondered what Germany was like today, wondering how have they moved on after such a painful past. In college, I studied abroad in England where I read Goodbye to Berlin, a novel by Christopher Isherwood, set in Berlin’s eerie prelude to World War II. The protagonist said, “I am a camera,” wanting to just record the events as they happened, to remain a detached observer. Yet he soon realized that you can’t remain detached because you become involved. You care. This novel turned into a screenplay which eventually led to the hit Broadway musical Cabaret, later a film starring Liza Minnelli. My interest grew. That semester, I visited Germany for the first time, exploring the Rhineland with a friend, impressed by Germany’s amazing culture and beautiful landscape. I liked Germany. I liked the Germans. History was clearly history in this country that has moved on. Don’t mention the war. 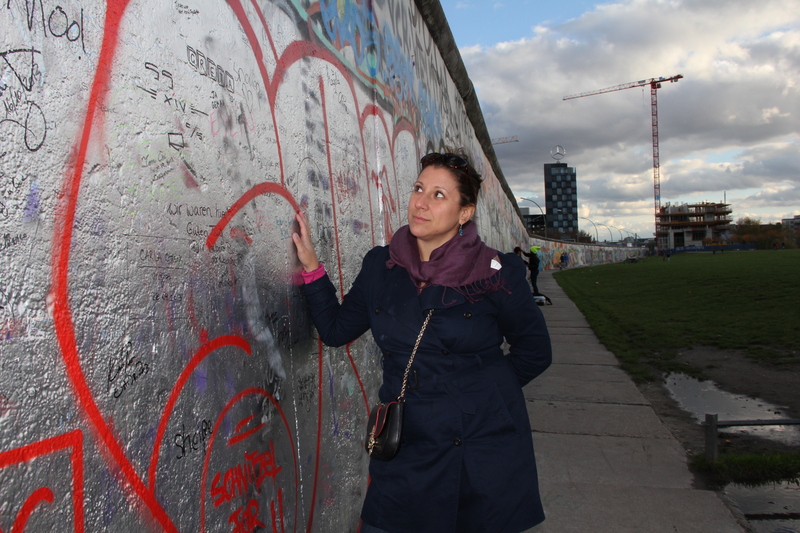 In 2006, I ventured “beyond the Iron Curtain” for the first time. Ok, the former Iron Curtain, but growing up in the 80s, it was hard not to view Eastern Europe without thinking of life before the fall of the U.S.S.R. As I crossed from Austria to Hungary on the train, I felt a chill and a thrill, going somewhere that seemed so forbidden as a child, memories of long lines for food and basic necessities– then the long lines at the first McDonald’s. Here I was now, crossing borders into free countries. On that trip, I explored Budapest, Prague, Cesky Krumlov, and then headed down to Dubrovnik before back to Switzerland and home. I truly enjoyed my time: learning much, spending little, and exploring fueled by a decade of curiosity of life in Eastern Europe. Things were changing. Prague was modern, hip, cosmopolitan. Cesky Krumlov was a little gem along a river — fresh air, a valley, restored and inviting medieval streets with few tourists. It was absolutely lovely. But Budapest. . . Budapest bothered me. The facades were destroyed at street level. Buildings that once looked like Parisian architecture were cemented over, painted uniformly gray. To see the beauty in Budapest, you had to look up. And that just made me even more sad, grieving for what history has ruined. Pockmarks from shells, bullets, and grenades marred the buildings and streets. Tracks from the tanks scarred cobblestones. The stores didn’t offer much. The city was clearly poor, struggling. This was 2006. They just needed a bit more time. Decades later, Budapest is apparently doing much better, and I’d like to visit again. But I’m glad I saw Budapest then — it helped me get a feel for how grim the past was. 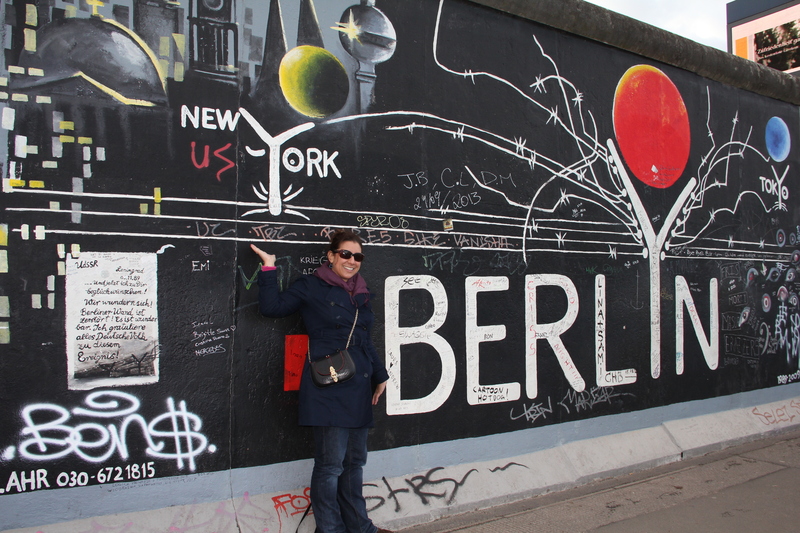 Always a travel addict, I devoured armchair travel when I was not on the road, watching episodes of Rick Steves and Samantha Brown, learning about Berlin’s progressive attitude, high quality of life, vibrant art scene, and general good vibes as well as the abundant museums. 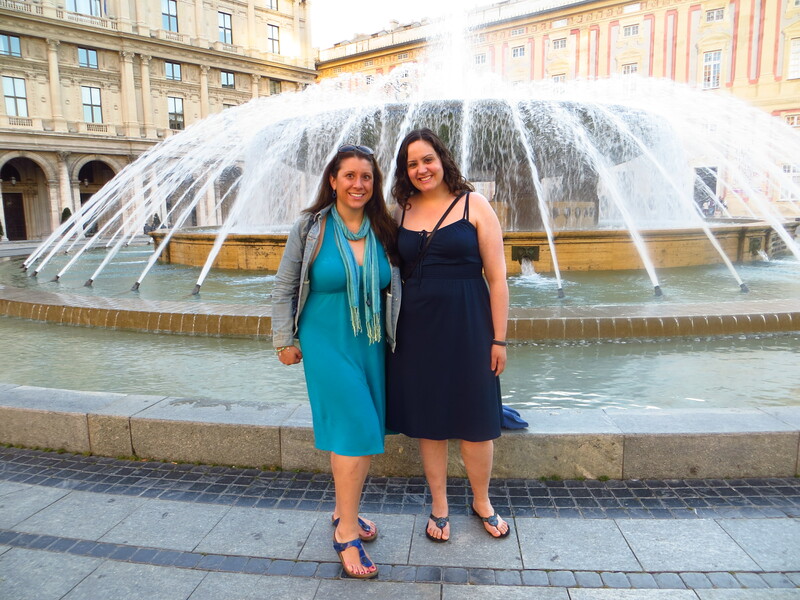 Berlin might not have the jaw-dropping scenery of Italy or the quaint charm of Bavarian cities like Munich, yet it had so much to offer from a cultural and historical perspective. I had to go. 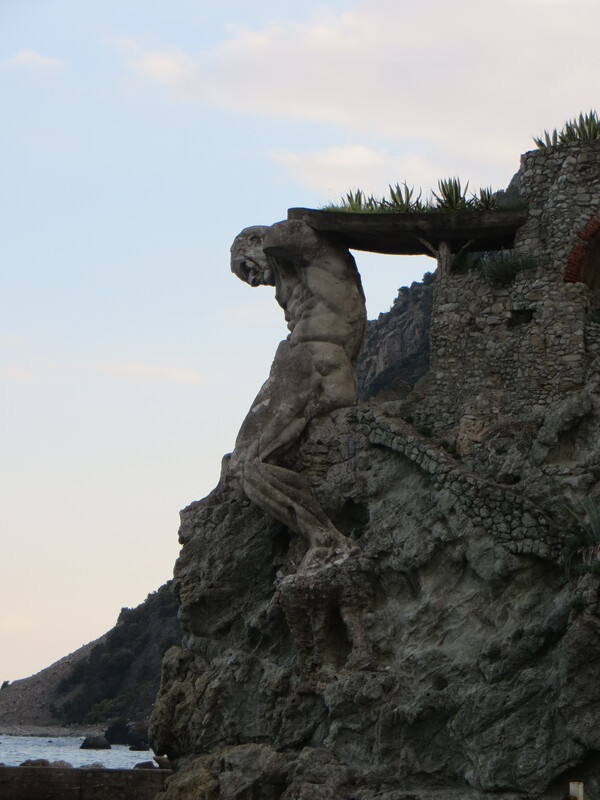 Once I moved to Italy, it topped my list for a weekend visit. 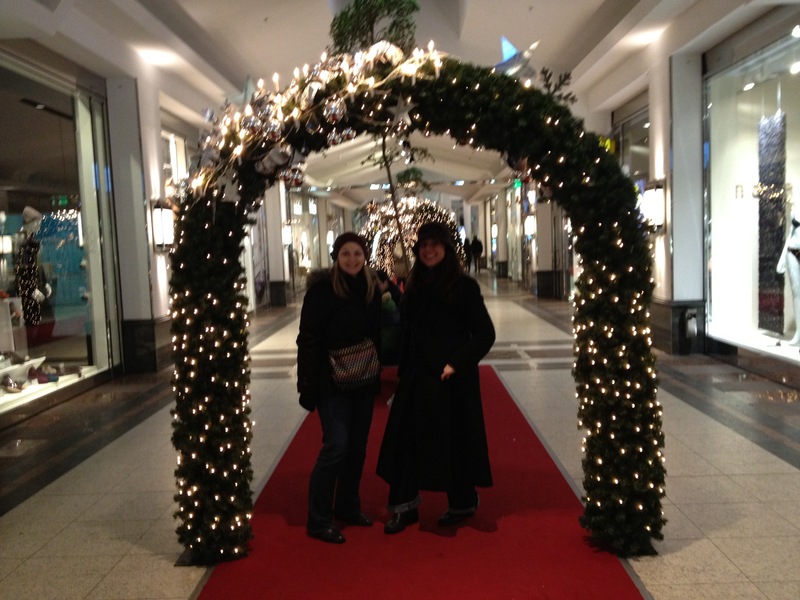 This year, I made plans to meet there with my friend Ashley (who resides in Düsseldorf). We planned for a weekend in November, my first available after much fabulous fall travel. Saturday, November 9, 2013. 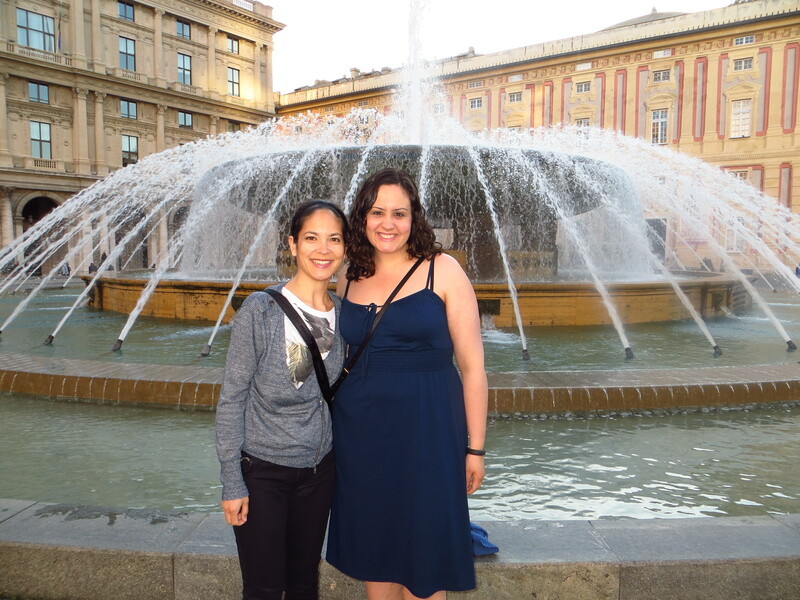 Ashley and I strolled around the neighborhood outside our modern hotel until we reached a nearby palace. 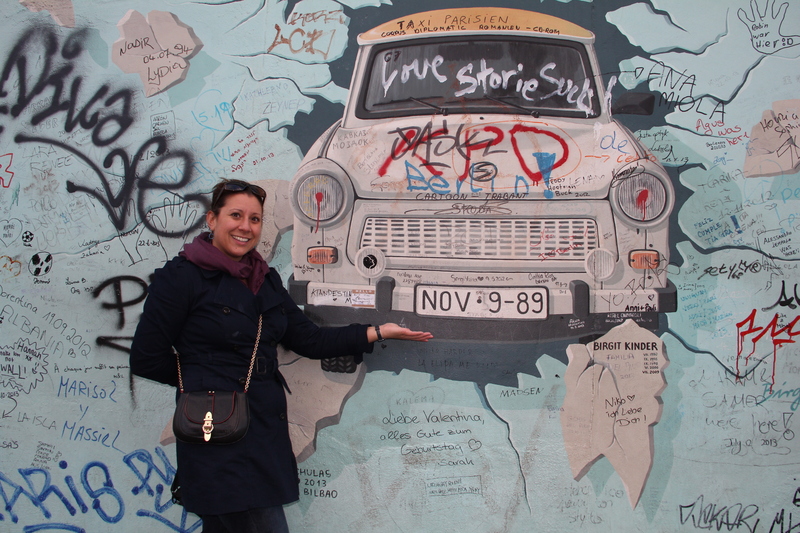 Next, we headed to the Eastside Gallery as it was a must-see for both of us. 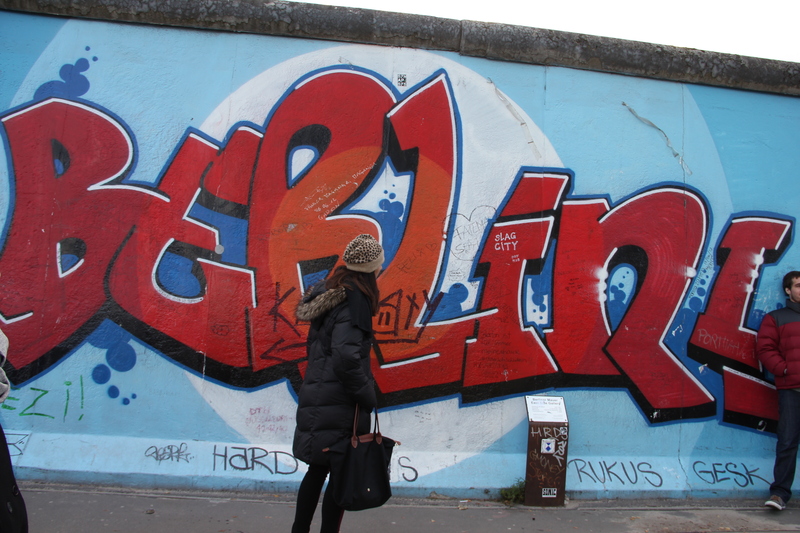 Here, we strolled along the remnants of the Berlin Wall, featuring graffitied murals. I walked up to the giant slabs, touching them, touching history, feeling an overwhelming connection to the past, almost dizzied by it. Did that 9-year-old girl ever think she would be here? As we walked along, posing for pictures, reflecting, we ended up walking in front of some television cameras while someone was announcing things in German. We wondered what it was about but kept walking along, snapping more photos. Then on the way back, I stopped to pose in front of one mural featuring a car with today’s date on the license plate. November 9, 1989. “Is today the anniversary?” I asked Ashley. A quick search on google confirmed the answer, and then I was really in awe. What a fortuitous travel coincidence. Later that day, we explored an alternative hippie playground that reminded me of the vibe in Christiania in Denmark, as I wrote about here. When we spotted it from the train, a local said, “It’s like a playground for adults.” A giant cat statue peeked above the trees, so we vowed to find “Cat House” later. We followed the cat across the river, although once we arrived, we were clearly not welcome. There was some kind of cool party going on inside, but when we tried to enter, they said they were closed. 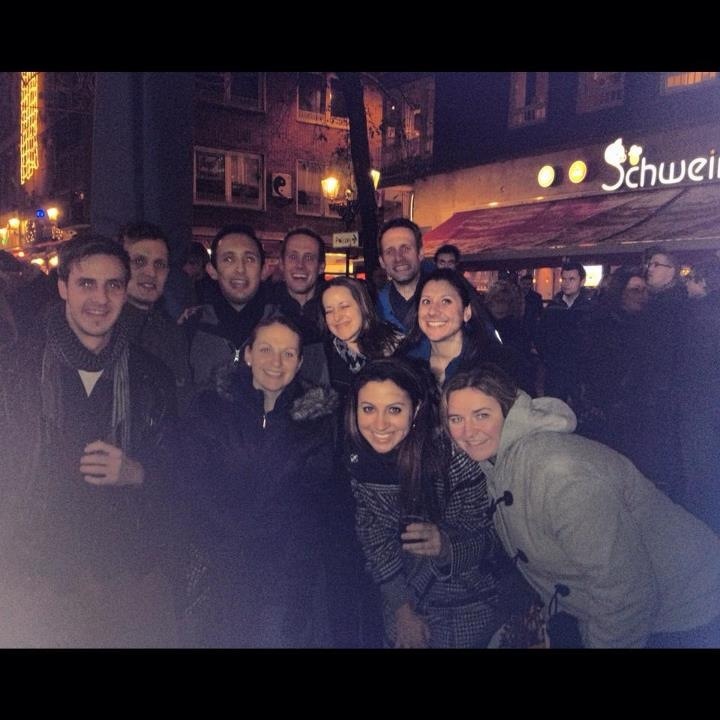 After departing, we grabbed a yummy currywurst (I learned all about these from Samantha Brown). We then walked to the Jewish museum, which was a celebration of Jewish history and culture as well as a sobering remembrance of the horrors of the Holocaust. There is an art installation where you enter a pitch-black unheated space, hearing only the echoes of those breathing around you. Quite an impact. 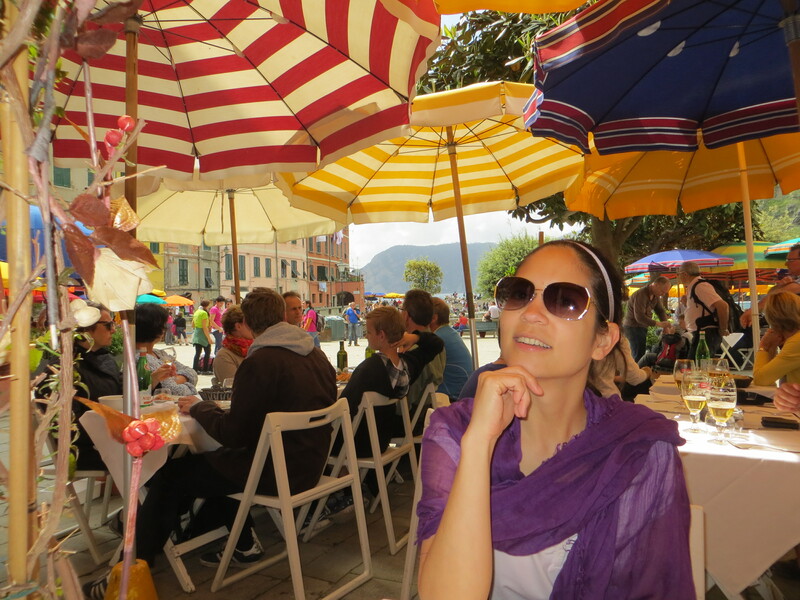 With Berlin’s cosmopolitan vibe, I was excited to explore multiple food options since in Genoa it’s mostly just Italian food. We had an excellent Greek dinner followed by drinks at the hotel before heading to sleep in our 7th floor room overlooking the train station. 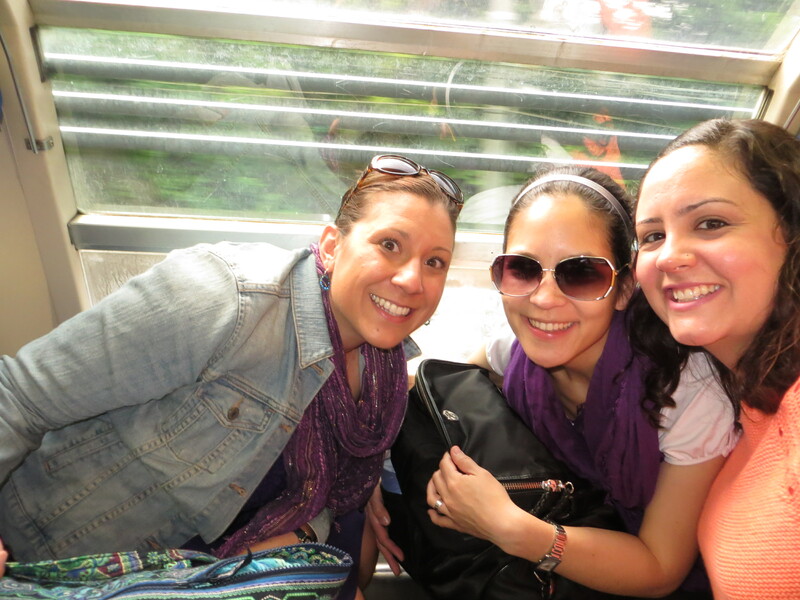 The next morning, we hopped on a bus tour. While some scoff and mock them, I love bus tours because you can learn a lot, easily and efficiently see all the major sites, and be carted around for a nice relaxing break. 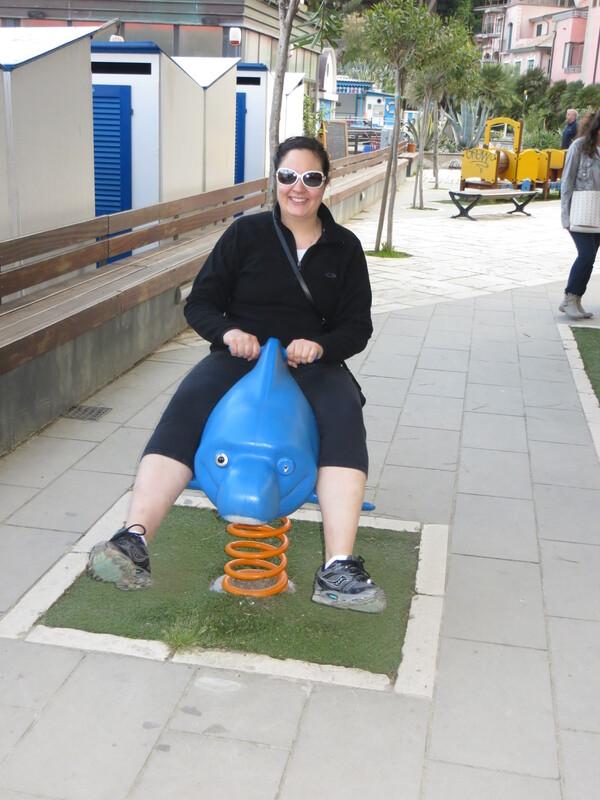 Travel can be so much go-go-go–especially after yesterday where we walked almost all day, and Ashley blistered her poor feet. 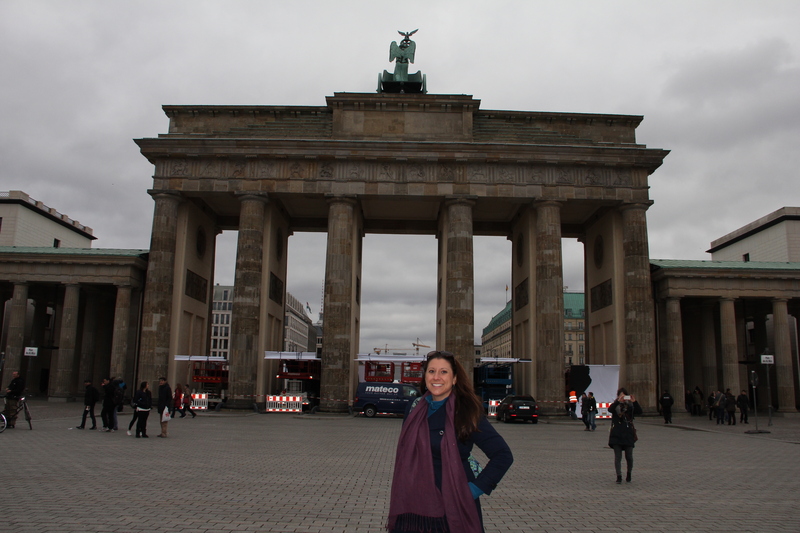 After the tour, we visited the Brandenburg Gate and Checkpoint Charlie, two more iconic images from the media during my youth. 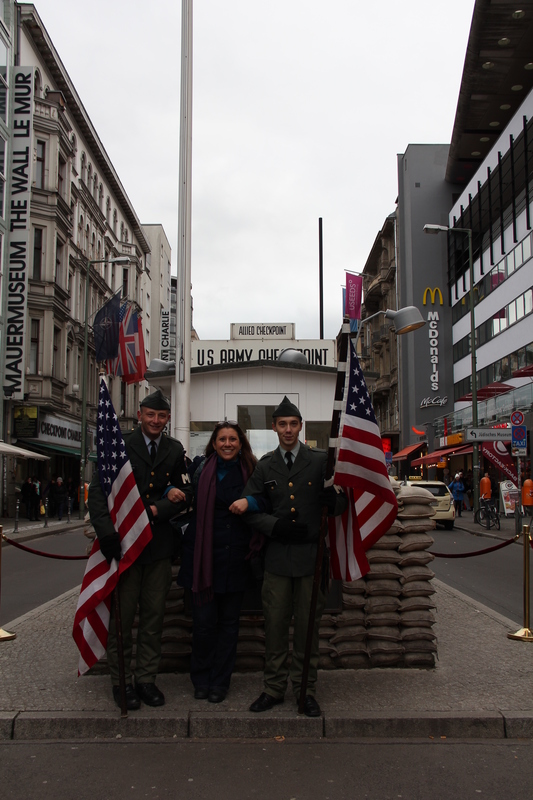 At Checkpoint Charlie–the most popular crossing between the American and Soviet sectors–I posed with some Germans in US military uniforms, then we went to the museum, as featured in this episode of Rick Steves. The next room featured a whole dedication to Reagan’s life. As we left the museum, I had plenty to reflect upon. 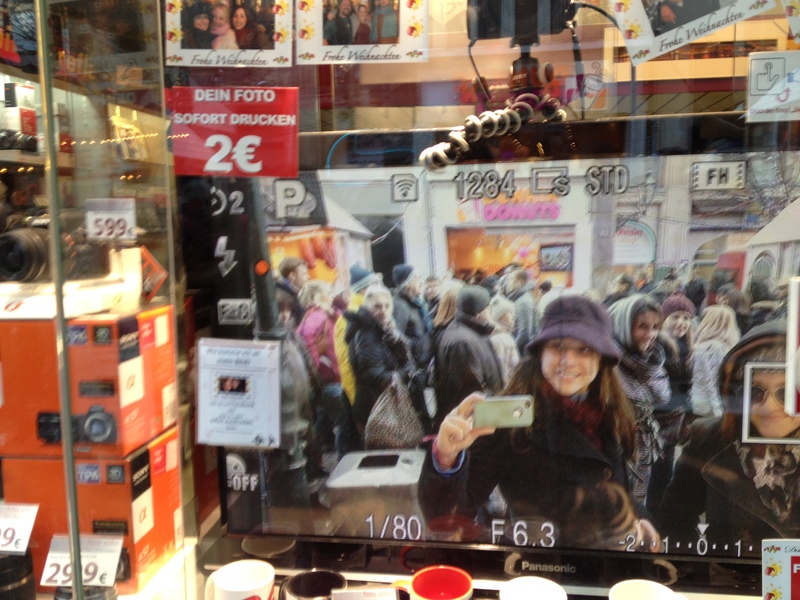 I only saw 3 of Berlins 200 museums and barely scratched the surface of this vibrant, artsy, creative city. I had to return. 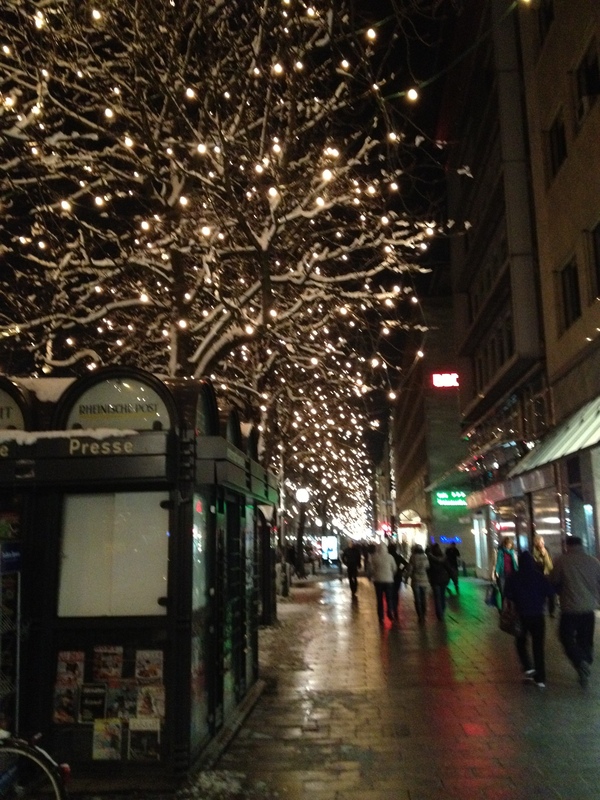 The air was crisp and invigorating as we made our way back to the hotel and eventually to the airport. 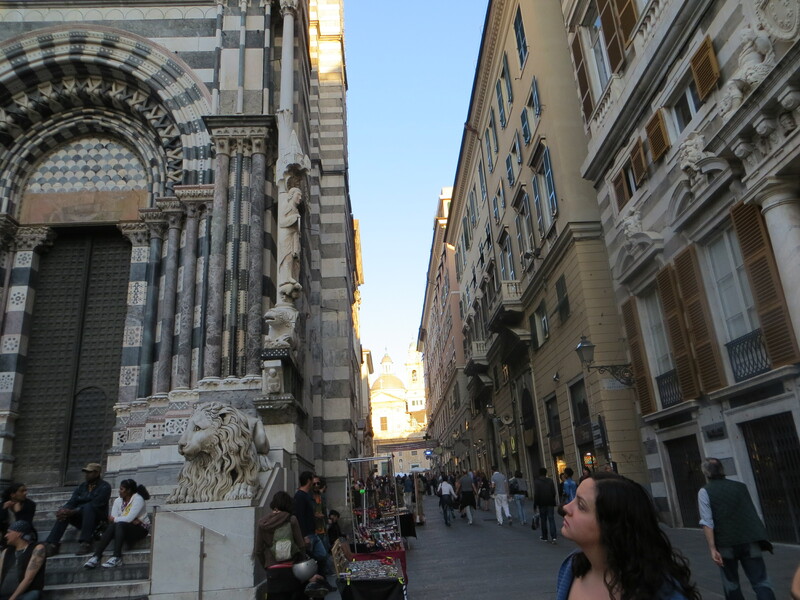 As Air Berlin whisked me back to Milan, I relished my freedom to easily hop borders. 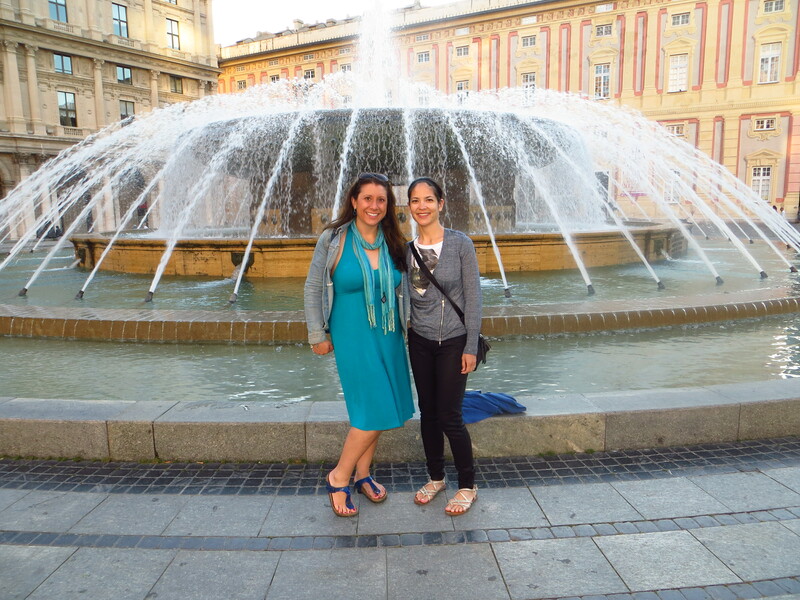 Living in Italy, I have many wonderful colleagues and friends. However, nothing can replace my best friends at home, friends who have become like family. 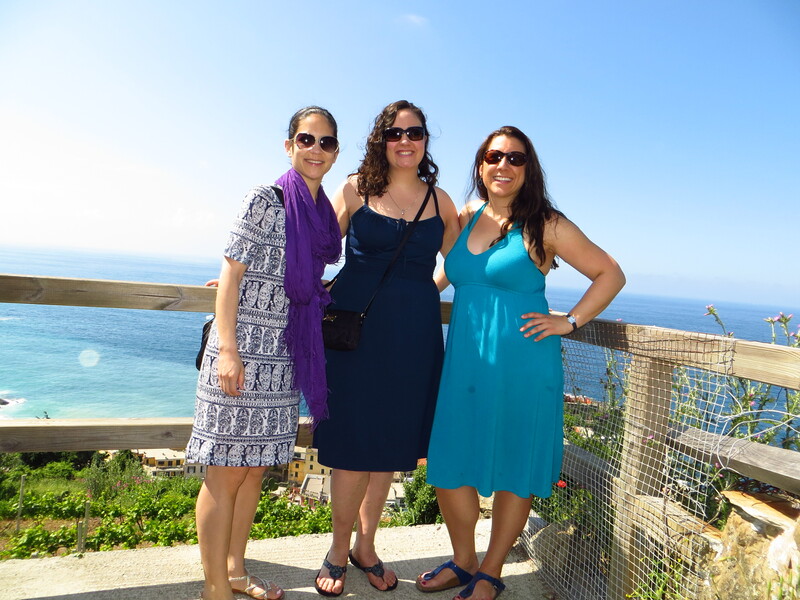 In May, I was super lucky that two of those friends visited at the same time, ladies I’ve known for about 19 years. 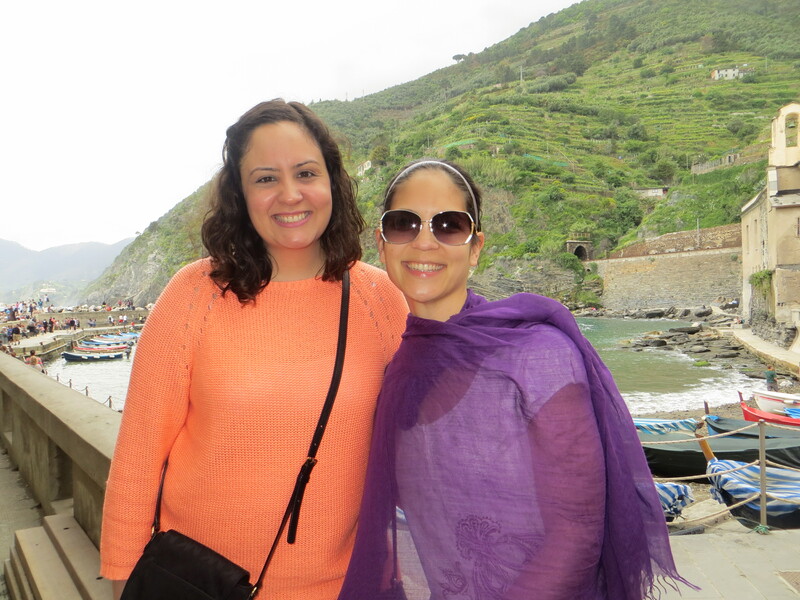 When Jen and Anna arrived, we called it “Waldwick Girls in Italy.” And that entire time, I felt at home and was filled with pure joy as I had the best of both worlds. They arrived on Friday May 10th and flew back early morning on Tuesday May 14th for a quick Girls’ Getaway. 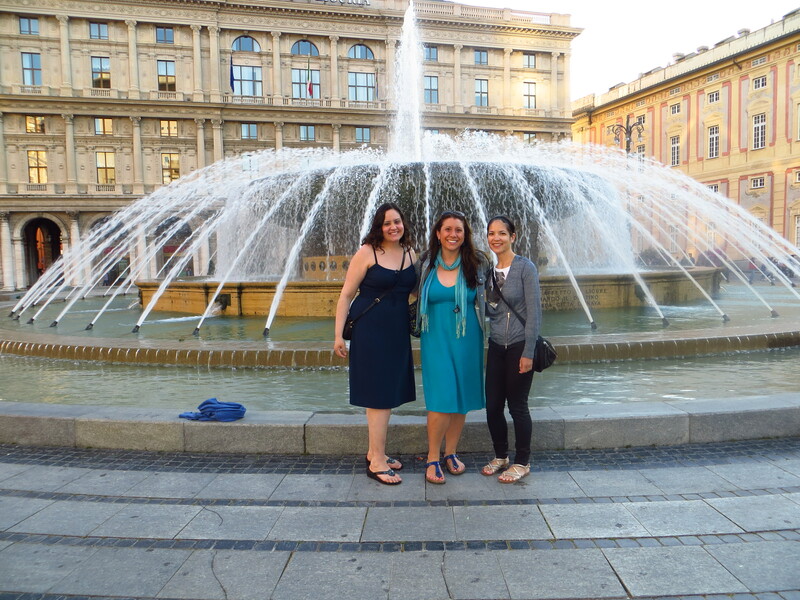 I know Jen and Anna from the track team in high school, and since then we have had many, many adventures from road trips to meets at Princeton and Brown University to visiting Jen in California to traveling in Belgium and Switzerland with Anna. Now it was time for us to kick back, chillax’, catch up, eat up, and soak up some sun. Would the weather finally cooperate? Upon their arrival, I escorted the girls to my apartment for a nap while I finished the workday. 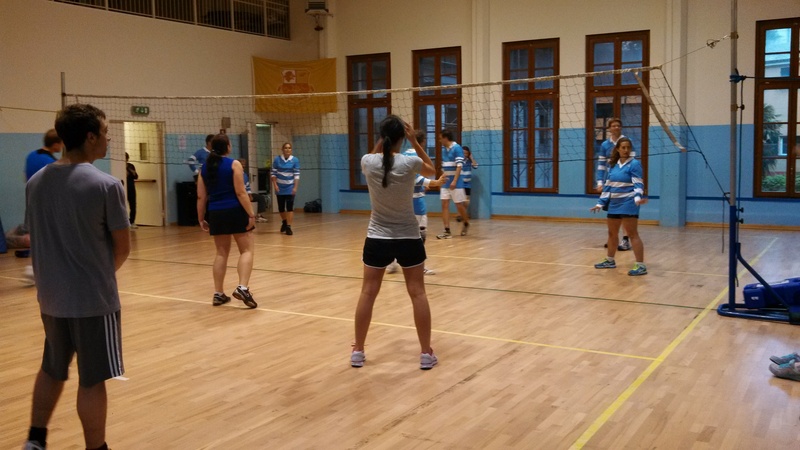 Afterwards, I went down to change for the volleyball tournament against the German School. They were our #1 fans, as we played. 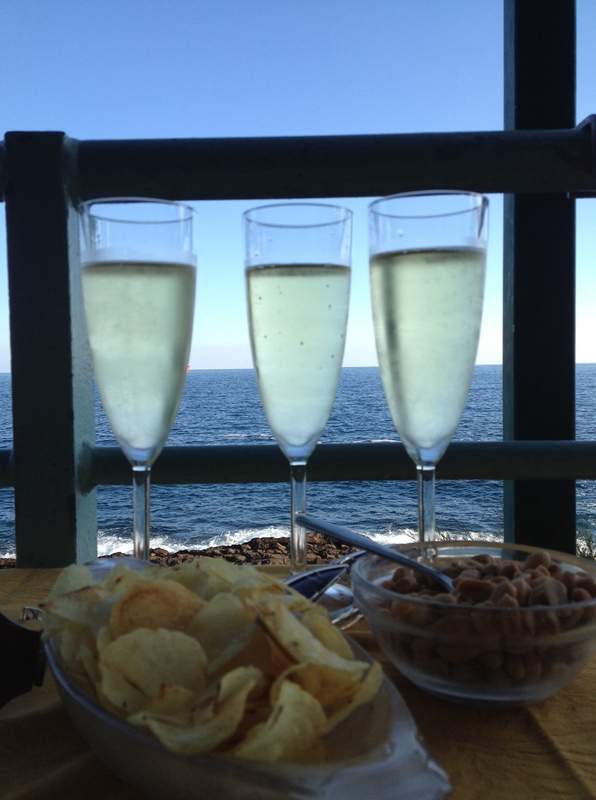 After a quick tour of the school, we met in the staff room for pizza, focaccia, salami, and of course prosecco. 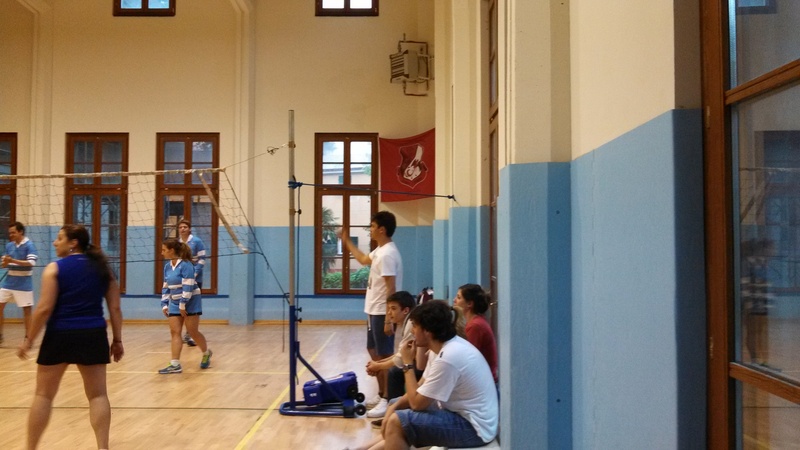 We had the opportunity to chat with the staff of the German School, all intimidating in their matching uniforms, then headed to the apartment to freshen up for dinner. The girls surprised me with many gifts. 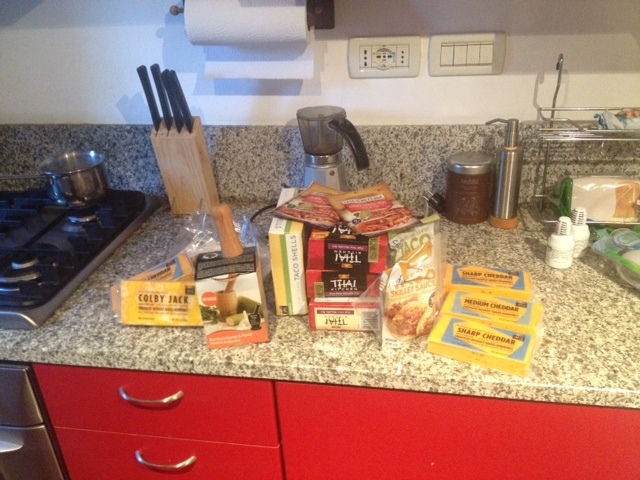 Anna brought a selection of tastes from home, including cheddar cheese! and ingredients for Thai and Tacos. Among other goodies I requested from home, Jen surprised me with a mortar and pestle so I wouldn’t have to make my guacamole with a bowl and shot glass. 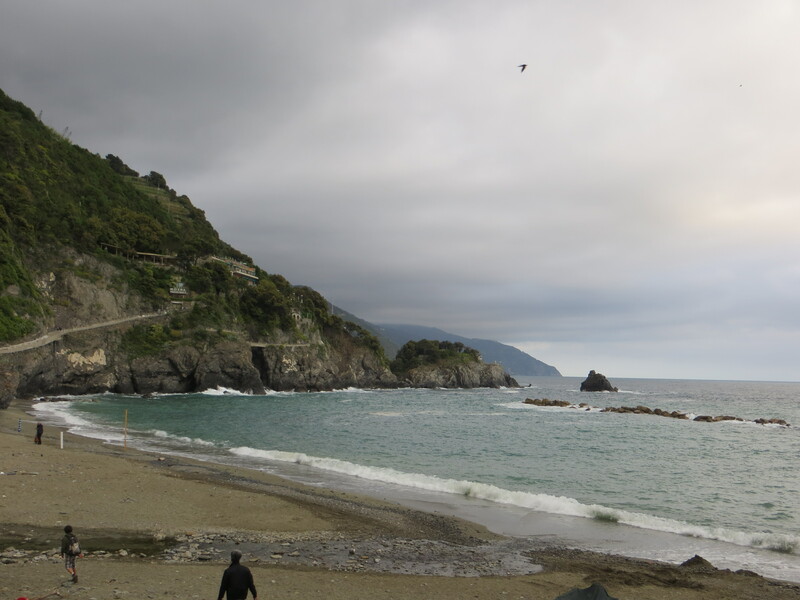 After the goodies, we walked down to one of my favorite restaurants by the sea, facing the beach where I love to swim. This upscale place is a bit expensive yet worth it for the delicious quality. 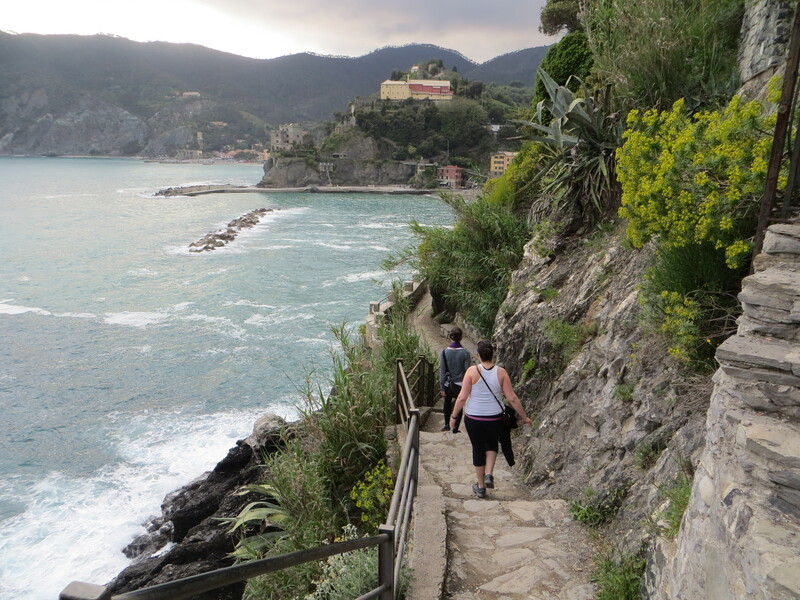 After a super delicious dinner and delectable desserts, we walked towards Nervi, enjoying the fresh sea air and views, then back up to my apartment where we tucked ourselves in for a relaxing night. On Saturday morning, we lazily awoke and convened in the kitchen for coffee and cheerful chatter. 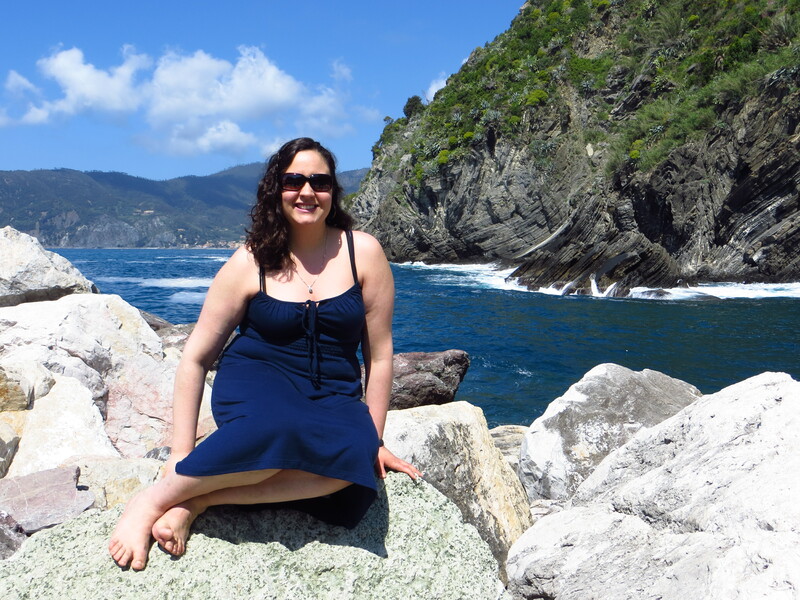 We didn’t preplan our train to Vernazza because there were many options, and we just wanted to rest. 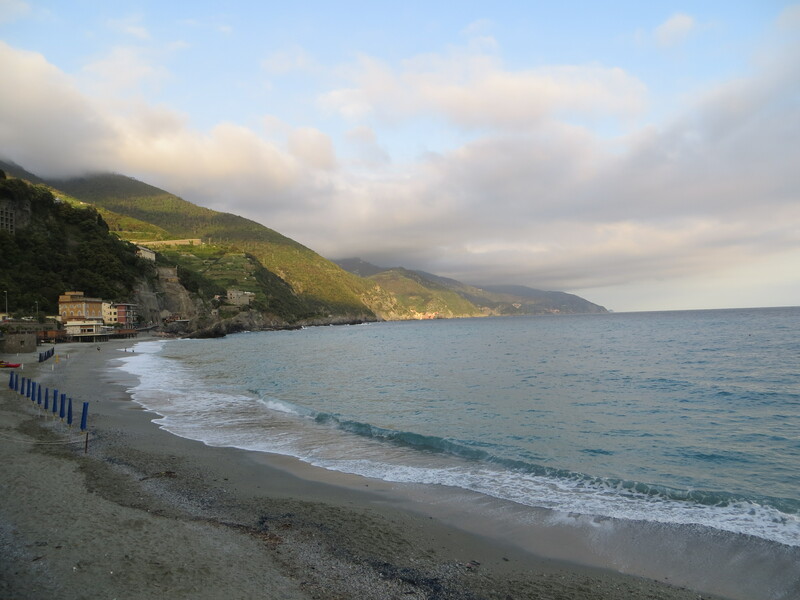 I put out a little breakfast spread for the ladies, then we were on our way to Nervi where we caught the train to the Cinque Terre. 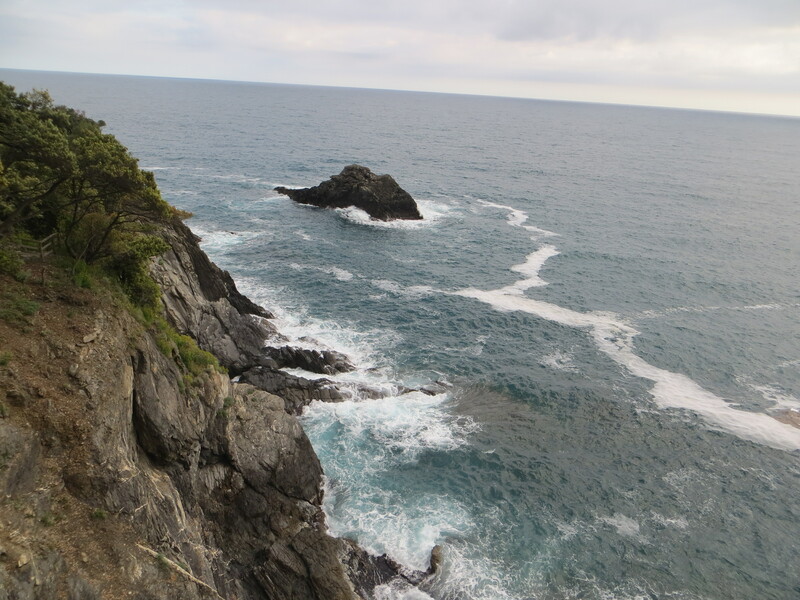 After a beautiful hour and 20 minutes, we arrived in the Cinque Terre. The Five Lands — 5 small villages nestled in the mountains along the rocky coast, villages that have preserved their own unique culture due to their isolated location for many years. It is possible to hike between all five villages, although after the devastating flood of October 2011 there are still parts of the trail that are not yet open. It took more than six months to clear the earth that swamped the villages– destroying homes and businesses, bridges and the landscape. 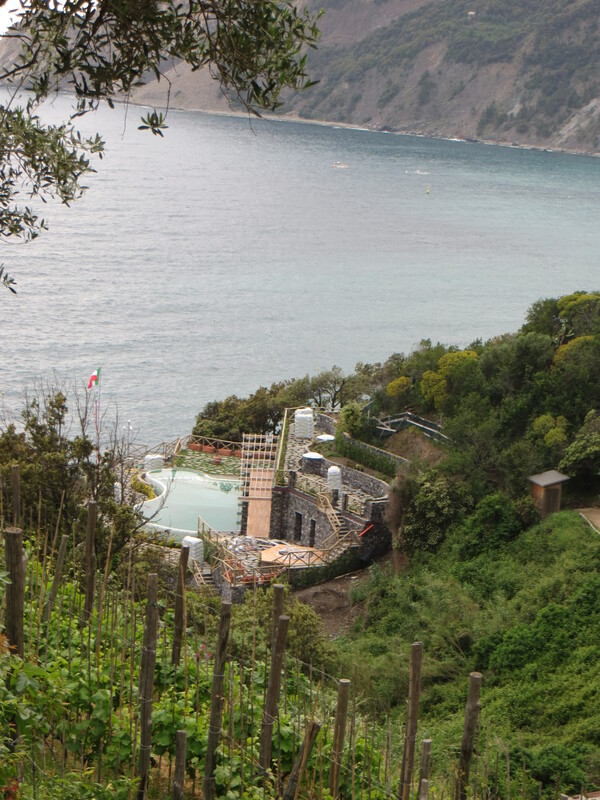 Yet with careful determination, 5 Terre was open for business last summer and was looking absolutely great for our visit this May. On his site, my travel idol Rick Steves explains the disaster and recovery efforts. He also provides much amazing information about the region. He may be the reason why the predominantly heard language in the 5 Terre is English, and most of those folks are toting his guidebooks. But these are my favorite type of traveler, so I don’t mind. 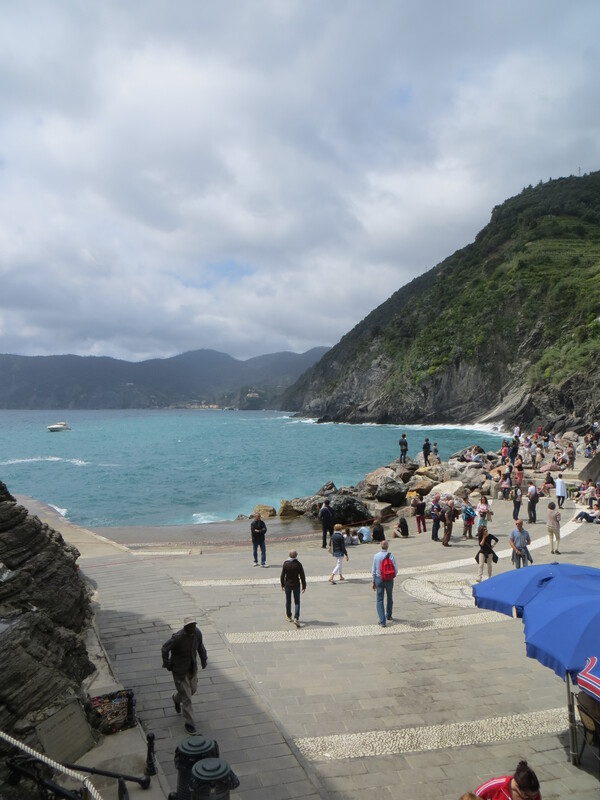 When we arrived in town, we were happy to see that Vernazza was almost back to her old self, vibrant and restored. But it’s impossible to forget the floods, as a giant photo reminds visitors as they exit the train. 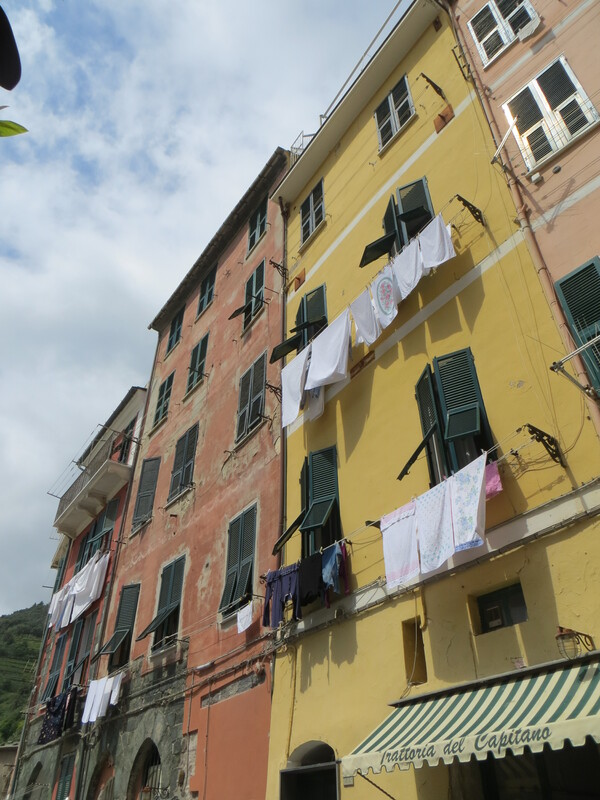 We walked up the main street to our charming B&B, where we checked into our quaint room, then proceeded to walk around, explore town, and enjoy a great lunch. 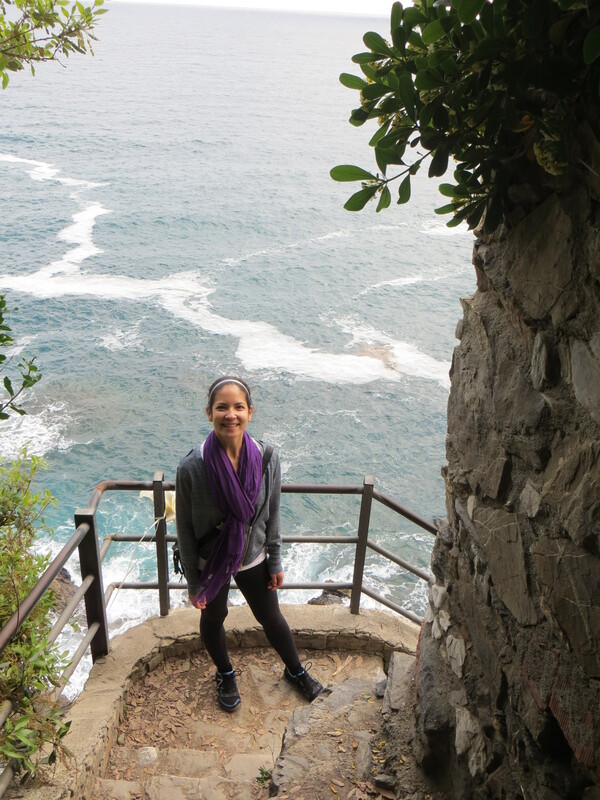 After a delicious meal, we hiked through town and then decided to stroll to enjoy the gorgeous views on the trail to Monterosso, where I stayed with my mother in April. The following slideshow features highlights of our journey. At the conclusion of our awe-inspiring hike, which was also an amazing workout, we saw a line. 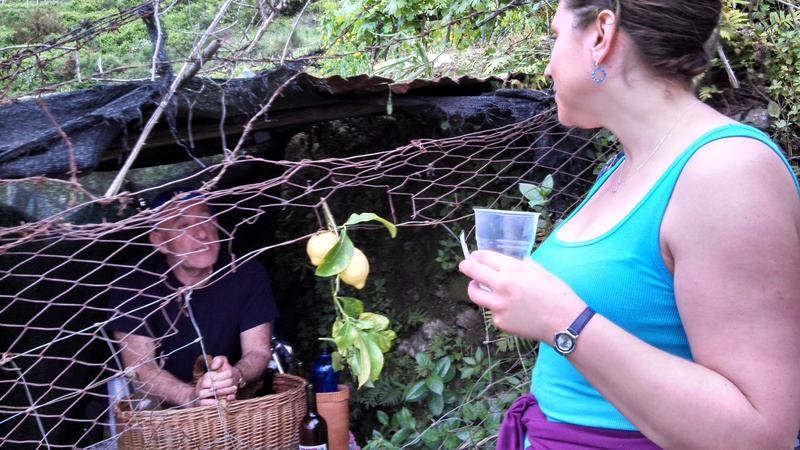 People were queuing up for a limoncello and lemonade stand on a man’s farm, served fresh from the lemon trees. 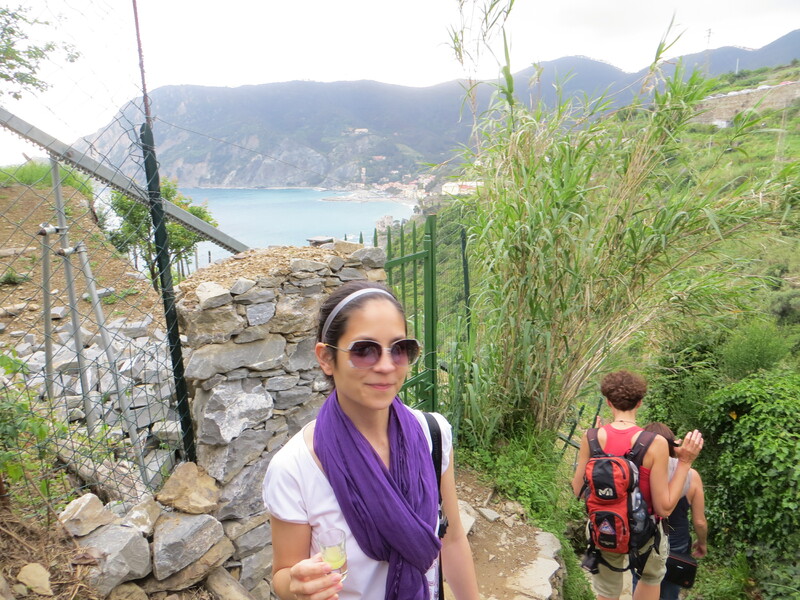 Anna and I enjoyed lemonade while Jen had limoncello. I had a sip and regret not buying any. I’ll have to go back. Luckily it’s so close that I can return. 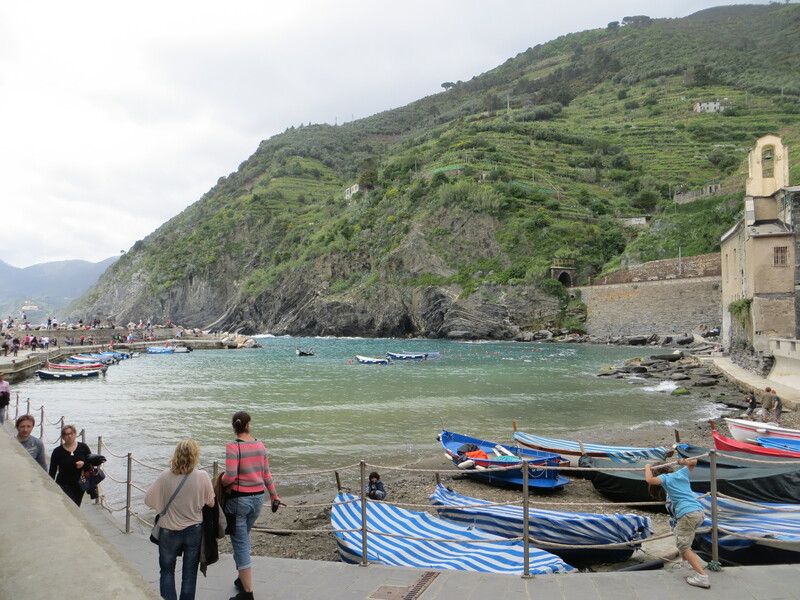 We made friends with the old man selling the lemonade, and he invited me to go on his boat one day when he’s in Genoa. I have his business card. 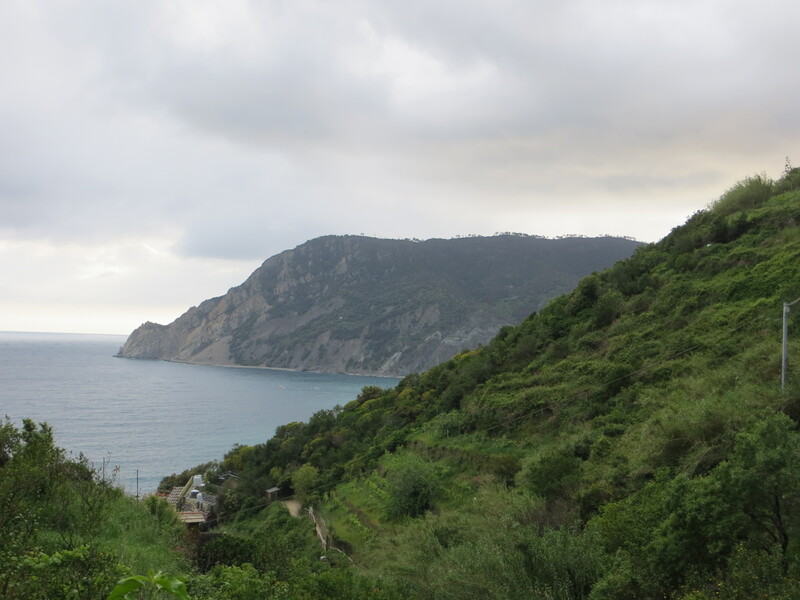 Next, we completed the trail then to Monterosso. then I took the girls straight to Cantina di Miky where a fellow Waldwick Girl works, as mentioned in my previous Cinque Terre post. 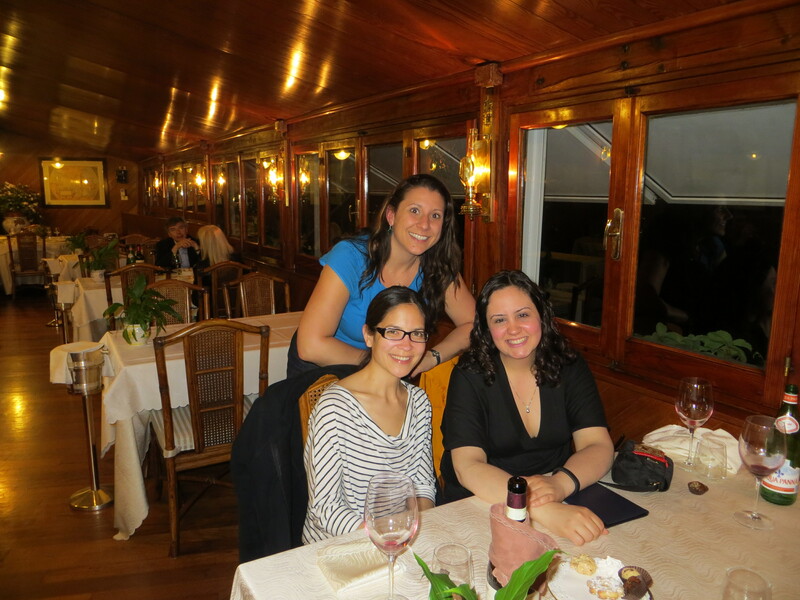 We enjoyed a delicious meal, then posed for a picture with Christine. 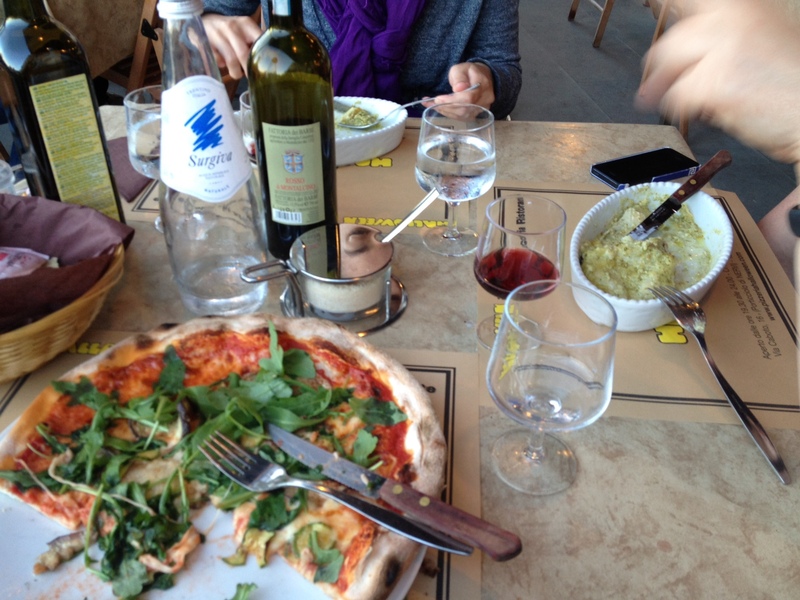 We had delicious food, and anna especially loved the fried stracchino and vowed to recreate it when she returned home. She even found a distributor for stracchino in the US. 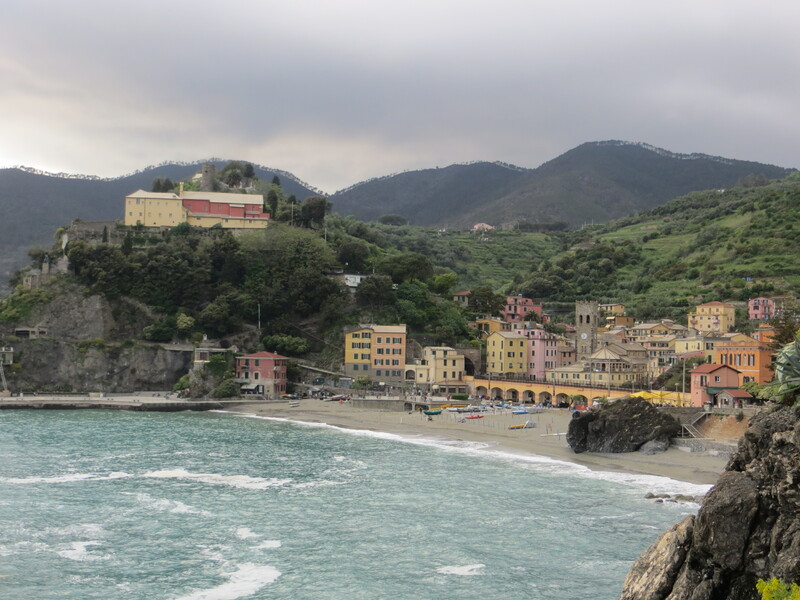 At the conclusion of our meal, we were happily buzzed and boarded a train for a quick ride back to Vernazza and our cozy hotel room. I fell asleep before I even touched my book. Unfortunately, the girls had a bit of jet lag and were up a while. But we woke up happy the next morning and enjoyed breakfast at the restaurant downstairs run by twin brothers from Sicily. Sicilian breakfasts are very, very sweet. The guys entertained us, and I got another business card as I made more friends once they realized I lived locally. “Come back and visit soon. Watch TV, you will learn Italian,” they said as I left. We had just enough time to hike the hills right in town for some gorgeous photos. 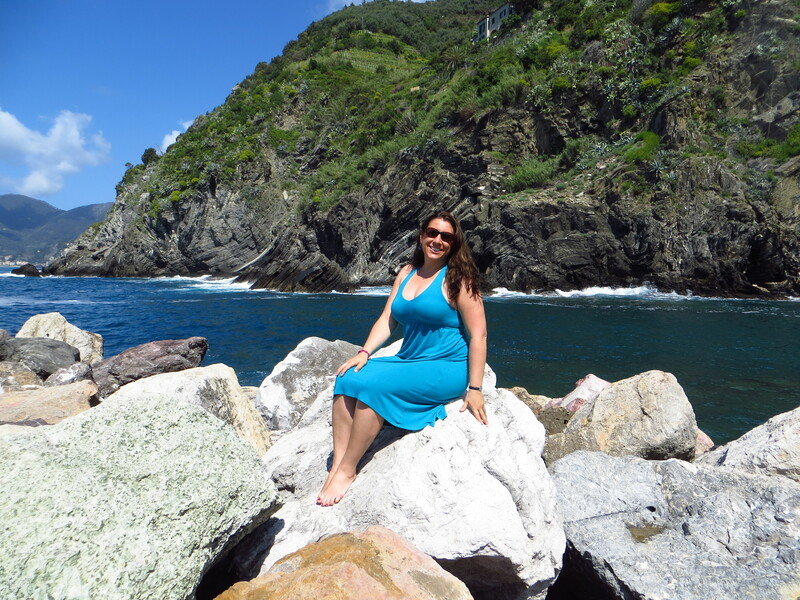 Finally, the Cinque Terre under stunning blue skies. Splendid. On top of the world on a gorgeous day. 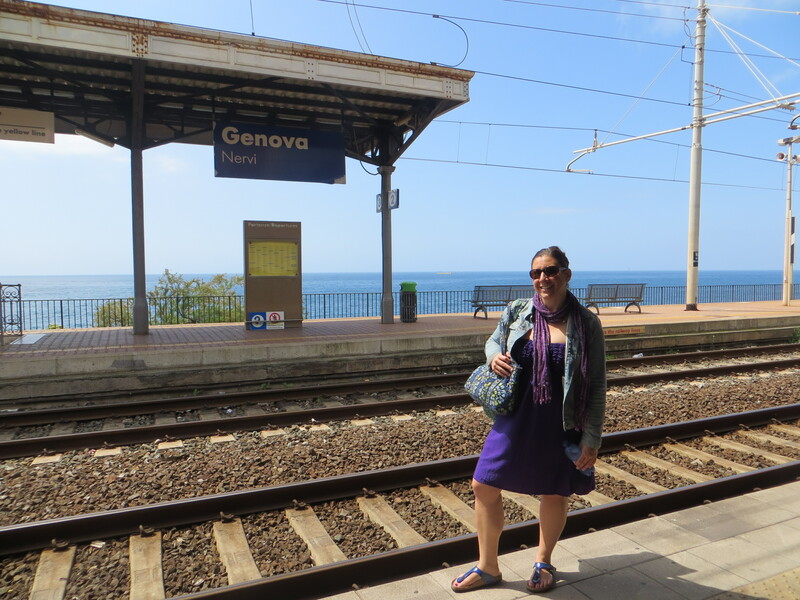 After a Siren photoshoot, we boarded the train for Genoa, where it was finally swimming weather. We enjoyed a couple of hours on my local beach before dinner. 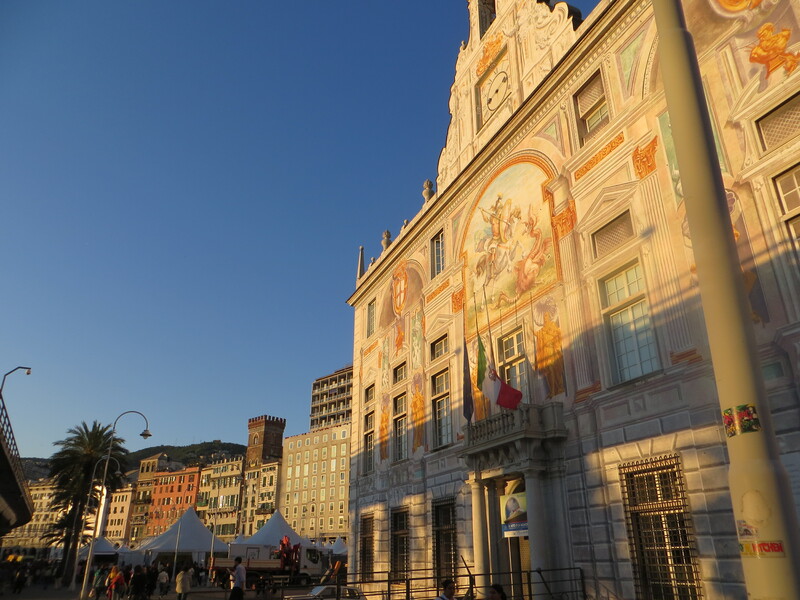 Next, we explored Genoa’s Medieval Center, where I gave the girls some tips for tomorrow’s exploration as I would sadly be at work. 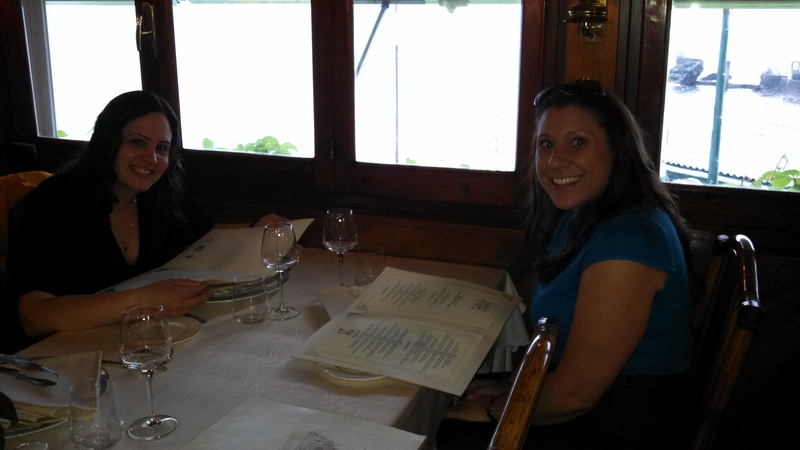 Then we enjoyed a nice meal at the Porto Antico. 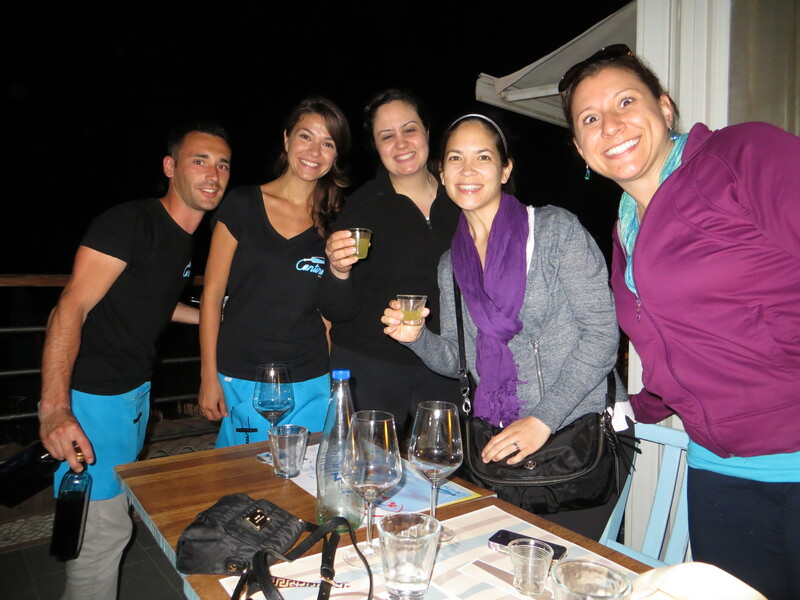 then concluded the evening with a meal at Halloween, a pizza place in the little port of Nervi. Back to the hotel for vino and Girl Talk before I headed to my apartment for sweet dreams. The girls left very early the next morning, and I missed them right away. 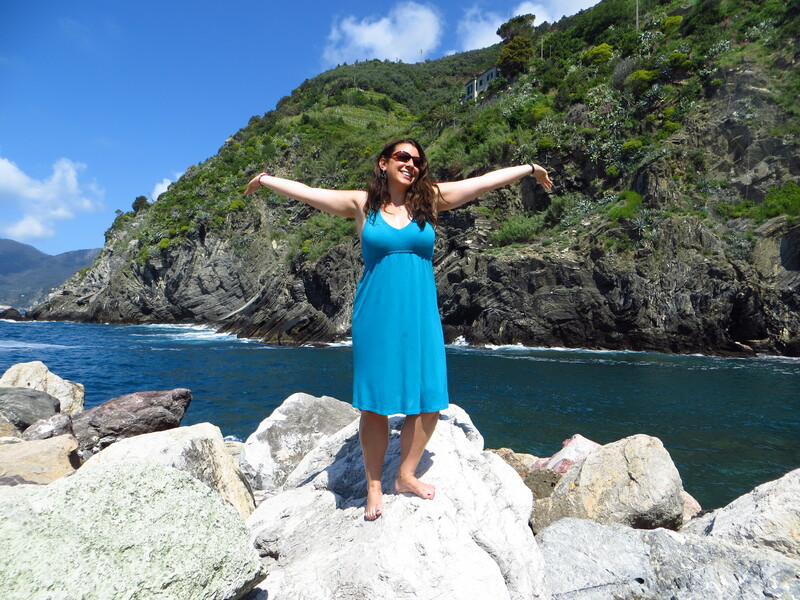 I was so grateful for such a wonderful and joyous mini-break! Thanks Jen and Anna!